We are calling all Canadians to take on this first Citizen Challenge! It’s simple! Trees and plants clean our air, provide shelter for wildlife, produce medicine and food and help to regulate the temperature in cities. So for this first challenge, we’re encouraging Canadians to develop their green thumb. 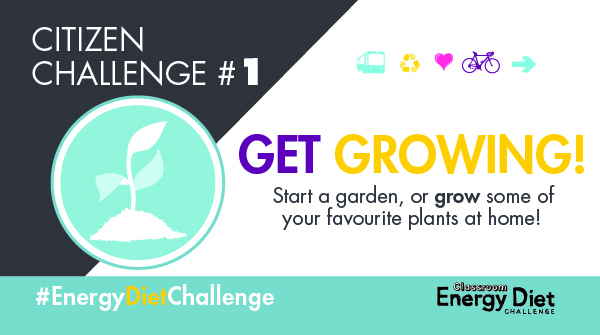 Modeled after one of our 16 Classroom Energy Diet Challenge challenges — Get Growing—this challenge invites you to show us your gardens, big and small! Potting mix — See above! Some planters — You can buy ready-made planters, or improvise. Empty yogurt containers make perfect starter homes for seedlings! Once you’ve gathered your materials and found a place to start your plants, it’s time to get growing! Follow the instructions on your seed packets, and in a couple of weeks you should start seeing little green shoots. To enter the contest, take a pic of yourself with your garden and share them with us along with a green thumb tip. Submit the picture and tip to us at info@energydiet.ca or leave a reply to our Citizen Challenge #1 social media posts on Twitter or Facebook. Entries must be received before noon on Friday, April 12th. To be eligible to compete in the Citizen Challenges, you must be a resident of Canada and over the age of 18. A draw will take place in the afternoon of Friday, April 12th and three potential winners will be drawn. If eligible, each will receive a $100.00 Shell gift card. Are You Ready For The Video Challenge?